For the automobile sold in Canada as the "Suzuki Swift+", see Chevrolet Aveo (T200) and Chevrolet Aveo. The Suzuki Swift (Japanese: スズキスウィフト) is a subcompact car produced by Suzuki. 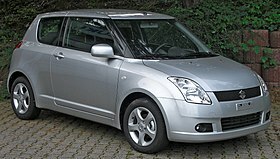 The Suzuki Swift is classified in B-segment in European single market, segment known as Supermini in British islands. Prior to this, the "Swift" nameplate had been applied to the Suzuki Cultus in numerous export markets. The Suzuki Swift began in 1983 as a marketing and manufacturing rebadge of the Suzuki Cultus, a supermini (or subcompact) manufactured and marketed worldwide across three generations and four body configurations—three-door hatchback, four-door sedan, five-door hatchback and two-door convertible—and using the Suzuki G engine family. The Swift was marketed in the Japanese domestic market (JDM) as the Cultus and elsewhere as the Suzuki Swift, Suzuki Forsa, Chevrolet Swift, Chevrolet Sprint and Sprint Metro, Geo and Chevrolet Metro, Pontiac Firefly, Maruti 1000, Holden Barina and Subaru Justy. Versions of the second generation Cultus were also produced until 2007 in India and the car remains in production today in Pakistan and China. For more information on the initial versions of the Swift, see: Suzuki Cultus and Geo Metro. The first generation Swift was introduced in 2000 as a replacement for the Suzuki Cultus. Outside Japan, the "Suzuki Ignis" name was used. Both three- and five-door hatchback body styles were offered, although the three-door was not offered as part of the regular lineup in Japan. The Swift was powered by a new generation of Suzuki inline-four gasoline engines, the M family. Engine displacements of 1.3 and 1.5-litres were offered, both with a five-speed manual transmission or optional four-speed automatic. The vehicle was available with either front or four-wheel drive. Vehicles fitted with the 1.3-litre engine were designated HT51S, with the 1.5-litre version assigned HT81S. The shorter three-door body variant formed the basis of the Swift Sport in Japan, or Ignis Sport in export markets. Introduced in 2003, it featured redesigned bumpers, and was fitted with a higher-output version of the 1.5-litre engine. The Sport ceased production in 2005, with the regular Swift models remaining until 2006 for the Japanese market only. In 2001, General Motors introduced the Chevrolet Cruze—a crossover SUV based on the Swift, retaining the original car's basic dimensions and powerplants. The Cruze was restyled, adopting a crossover look between a tall hatchback and a sport utility vehicle, and the three-door body was dropped. The "Chevrolet Cruze" commercial designation was used in Japan, while in Australia the car was sold as the "Holden Cruze" from 2002 to 2006. The 1.3-litre cars were given the model code HR51S, with the 1.5-litre versions coded HR81S. Suzuki in Europe introduced the Cruze modifications as an update of the Ignis in 2003, although extended by 145 millimetres (5.7 in) in length, thus improving interior and luggage dimensions. Due to an agreement with Subaru, this model was also sold throughout Europe in all-wheel drive form as the Subaru Justy from 2003. These Europe-only models were manufactured by Magyar Suzuki in Hungary. Due to the local presence of the Chevrolet-badged model, Suzuki in Japan did not utilise the modifications for a Suzuki-badged model of its own. The second generation Swift debuted at the Paris Motor Show in September 2004. The design of the new Swift was previewed on the Concept S and Concept S2 concept cars at auto shows, in the years leading up to its launch. This generation of the Swift marked a significant departure with the previous Cultus-based models, with Suzuki redesigning the vehicle as less of a "low price alternative" subcompact and more of a "sporty" subcompact. The Swift's design and driving characteristics focused on the European market with its chassis refined through a road-testing program across Europe. The second generation Swift has received a four stars out of five rating in the Euro NCAP crash tests. It also was awarded 2006 Semperit Irish Car of the Year in Ireland. Since its global launch in 2005, which was kicked off with a marketing campaign fronted by the footballer Cristiano Ronaldo in many European countries, the Swift has recorded above forecast sales in most markets. In Japan, sales figures have been twice the forecast and in many European markets the model has been a runaway success. The Swift was available with 1.3- and 1.5-litre petrol engines, rated at 92 metric horsepower (68 kW; 91 hp) and 102 metric horsepower (75 kW; 101 hp), respectively. It was produced in Hungary, India, Japan, Pakistan and by Chang'an Motors in China. In China and Japan, only the five-door body is available, and four-wheel drive is an option for the 1.3- and 1.5-litre petrol engines. A 1.2-litre engine fitted with an automatic continuously variable transmission (CVT) was offered in front-wheel drive only. In Europe, the Swift was launched in three- or five-door hatchback forms, with 1.3- and 1.5-litre petrol engines, and a 1.3-litre DDiS engine supplied by Fiat. The 1.3 petrol is also available with an automated manual transmission or with four-wheel drive. Both the 1.3-litre and 1.5-litre petrol models are available with four-wheel drive, and hold the chassis numbers, ZD11S and ZD21S. In October 2005, Suzuki launched the Sport version of the new Swift in Japan named Swift RS, and in September 2006 the model was introduced in most European markets. Named "Swift Sport", it is powered by an enhanced M16A unit, a high-revving 1.6-litre, naturally aspirated DOHC VVT four-cylinder engine with an 11.1:1 compression ratio, high lift cams, forged pistons, and strengthened valve springs. The 1.6-liter engine produces 125 metric horsepower (92 kW; 123 hp) and 148 newton metres (109 lb⋅ft) torque. At 3,765 mm (148.2 in), the car is 70 mm (2.8 in) longer than the standard Swift. The Swift Sport features sportier bumpers and spoilers, a stiffer suspension, twin exhaust pipes, red sport seats (with Recaro seats optional) and four-wheel disc brakes on 16-inch wheels. The European Swift Sport features five-speed manual transmission, the three-door body variant, 17-inch wheels (16-inch also available) and electronic stability control (ESC). The Maruti Suzuki Swift was launched in India in May 2005 with a 1.3-litre petrol engine. Later, in early 2007, Maruti introduced the Swift with a Fiat-sourced 1.3 L DDiS engine. In 2010, due to the new BS IV emission norms, Maruti replaced the 1.3 L petrol engine with a 1.2 L K-series engine. The Suzuki Swift Plug-in hybrid concept car was unveiled at the 2009 Tokyo Motor Show. The Swift Plug-in concept has an all-electric range of about 30 km (19 mi) drawing on a lithium-ion battery pack. When the battery is running low a small 0.66 L engine kicks in to power a generator that charges the battery. In May 2010, Suzuki announced a demonstration program with 60 Swift Plug-in hybrids in Japan scheduled to start by late 2010. Initially sales of the Suzuki Swift plug-in hybrid electric vehicle were scheduled to begin by 2013. The plug-in car is powered by a 55 kW (74 hp) and 180 N⋅m (130 lb⋅ft) AC synchronous motor and a 2.66 kWh Li-ion battery pack. Average fuel consumption, calculated by combining fuel consumption during operation on electric power from grid charge and fuel consumption during hybrid operation after depletion of the battery pack is 37.6 km/L on the JC08 cycle (88.4 mpg US, or 2.7 L/100 km). Grid charge time for the battery is approximately 1.5 hours @ 100 V and 1 h at 200 V.
In March 2014 Maruti Suzuki announced that it will provide several copies of the production version, renamed "Swift Range Extender" as part of a pilot project to be conducted in partnership with the Indian government during 2014 to 2015. According to Maruti's tests, the Swift Range Extender delivers a combined fuel efficiency of up to 48.2 km/L (136 mpg‑imp; 113 mpg‑US), with an all-electric range of 25.5 km (15.8 mi). The battery takes nearly 90 minutes to get fully charged. Maruti is awaiting for the implementation of the India's National Electric Mobility Mission Plan 2020, which will define the government's purchase incentives for plug-in electric cars. The third generation Swift was unveiled on 26 August 2010. It went on sale in Japan on 18 September 2010. The third generation Swift is being produced at Suzuki's plant in Hungary from where it will be supplied across Europe. The new car has its wheelbase extended by 50 millimeters over the previous second generation and has many visual updates. While the new car looks different from the old one, its design is an evolution of the radical second generation styling with a longer and more rounded appearance. Post-September 2010 Swifts are fitted with a heavily revised version of the K12 engine found in the Suzuki Wagon R+d. 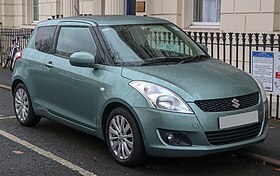 During September 2010, Suzuki in the United Kingdom released the third generation Swift onto British roads. The new generation is expected to feature a 1.2-liter VVT petrol engine developing 92 bhp. In some countries, the 3rd generation of Suzuki Swift uses a 1.4-liter VVT petrol engine (K14B) which produces 95 hp. In Thailand, the Swift is built locally and is part of the Thai government's eco-car program. The car is sold with a CVT automatic transmission on GA, GL and GLX variants; GA and GL variants are also offered with a five-speed manual transmission without anti-lock brakes. For the Indonesian market, the Swift was launched on 20 September 2012 at the 20th Indonesia International Motor Show and sold in two trim levels, GL and GX, with manual or automatic transmission. The GS trim level was added on 6 June 2015, which was launched at the 2015 Jakarta Fair. Sales of the Swift in that market were ended in April 2017. It was replaced by the Baleno hatchback in August 2017, which is slightly bigger and positioned in the same class as the Swift, as the fourth generation Swift is not released in that market. For the Malaysian market, the Swift was released on 12 July 2013. As with the previous generation, a four-door notchback saloon model was developed for India by Maruti in 2012. This is shorter than the previous generation; now at 3.99 m (157 in) it falls underneath an important tax threshold at four metres of length. The Suzuki Swift S-Concept was at the 2011 Australian International Motor Show. The concept car is powered by a 1.6-litre 4-cylinder engine combined with a six-speed manual transmission. At Paris, it was rumored that the next Swift Sport would get a 150-hp (112-kW / 152-PS), a 22 percent increase over the 2010 model. Riding on 18-inch wheels, the car now features a large spoiler, new headlights and rear lighting clusters. It has also been brought closer to the ground. Inside, designers included bucket seats, a new steering wheel, different instrumentation and carbon fiber trim. The 2012 Suzuki Swift Sport is powered by a revised 1.6-litre four-cylinder engine producing 100 kW (130 hp) and 160 N⋅m (120 lb⋅ft) torque. The 2012 model comes with the option of a six-speed manual transmission or a high performance CVT transmission with seven-speed manual mode and paddle shifters. Riding on light weight 17-inch alloys, the car now features a rear spoiler, a large front grille, body kit, new HID headlights and rear lighting clusters. The ground clearance is also lower than the normal version. Inside, designers included leather bucket seats with sporty red stitching and "Sport" mark, a new steering wheel and different instrumentation. In January 2014, The Swift Sport was updated to include a 6.1-inch combined satnav/dab radio infotainment touchscreen as standard. In the United Kingdom Suzuki has released another special edition of the Swift, the SZ-R, with a list price of £14,249 and limited to just 100 units. The SZ-R has a 136HP VVT engine and is capable of doing 0 to 62 mph in 8.7 seconds, and reaching a top speed of 121 mph, while returning 44 mpg. It is equipped with seven airbags, auto air conditioning, cruise control, Bluetooth connectivity and USB port, rear privacy glass and 17-inch wheels. For 2013, Suzuki updated the Swift with some minor cosmetic changes such as a revised front bumper, L-shaped LED daytime running lights on the foglamp housings, fresh 16-inch wheels, LED-type high-level brake lamp and new seat fabric design. For the Japanese market, it features Suzuki's newly developed DUAL JET ENGINE as well as Suzuki's ENE-CHARGE system and ECO-COOL, implemented from the Suzuki Wagon R. The new DUAL JET ENGINE uses the dual injection system on its 1.2 L petrol engine and it works by increasing vaporization, making combustion more efficient. It channels fuel to two intake ports instead of only one per cylinder. With the DUAL JET ENGINE and the ENE-CHARGE, fuel economy is now up to 26.4 km/L, calculated based on JC08 mode. In August 2011, Maruti launched the all-new third-generation Swift, with 1.2 L K-series petrol and 1.3 L DDiS engines. Maruti Suzuki later launched the midlife facelift of Swift on 28 October 2014. The facelift comes with both cosmetic and mechanical upgrades. The manufacturer also includes a new variant called LXI (O) and introduced three new colours namely Mysterious Violet, Fire Red and Granite Gray. Maruti Suzuki in India launched the second generation of its sedan Maruti Suzuki DZire (known as DZire as of 2012), which is based on the third-generation Swift on 1 February 2012. Unlike the previous generation, it is a compact sedan under 4000 mm. It shares its engines with the hatchback. Like the previous car, changes to the suspension have been made. It also has two-tone beige and black interiors, unlike the hatchback's all-black interiors. In 2009, Peter Scott won the Suzuki Swift Cup, the junior swift cup and the British Rally Championship R1 class. The fourth generation Swift debuted in Japan on 27 December 2016. The hatchback is built on the 'Heartect' platform which made its debut in 2015 and is the same lightweight platform used for the production of the hatchbacks Baleno and Ignis. It is equipped with either a 1.2 L (1,242 cc) 4-cylinder Dualjet petrol engine for the hybrid model developing 66 kW (90 PS; 89 bhp) at 6000 rpm and 120 N⋅m (89 lbf⋅ft) of torque at 4400 rpm; and a 1.0 L (998 cc) 3-cylinder K10C Boosterjet Turbo petrol engine for the global market developing 82 kW (111 PS; 110 bhp) at 5500 rpm and 160 N⋅m (118 lbf⋅ft) of torque at 1500-4000 rpm. In India though, it is expected to come equipped with a 1.2 L (1,242 cc) 4-cylinder K12B petrol engine and a Fiat sourced 1.2 L (1,248 cc) 4-cylinder DDiS 190 diesel engine. It is also anticipated that the India spec car can also get the 1.0 L (998 cc) 3-cylinder Boosterjet Turbo petrol engine. The Swift Hybrid was also displayed at the 26th Gaikindo Indonesia International Auto Show in August 2018. Suzuki officially unveiled the Swift Sport at the 2017 Frankfurt Motor Show. The car comes with a 1.4 L (1,373 cc) K14C Boosterjet engine shared with the Vitara S. The engine makes 140 PS (103 kW; 138 bhp) DIN at 5500 rpm and 230 N⋅m (170 lbf⋅ft) of torque at 2500-3000 rpm. It comes equipped with either a 6-speed manual or a 6-speed automatic transmission. Aesthetically, the Swift Sport has a completely new front fascia, a rear spoiler, 17 inch wheels, wider tyres and a front chin spoiler. Maruti Suzuki launched the third generation DZire sedan in India on 16 May 2017. It is based on the fourth generation Swift but, for the first time ever, it drops the Swift badge from its name.The second-gen DZire will still be in production and will be sold exclusively to fleet operators, while being rebadged as the next generation Swift DZire Tour. The third generation Maruti DZire is based on the HEARTECT lightweight platform derived from the Maruti Baleno and the fourth generation Swift. This platform uses Ultra-high tensile and high tensile steel in its construction, so as to not comprise on structural rigidity. Despite being lighter, Maruti claims that the new DZire is compliant with frontal and side impact regulations, as well as meets pedestrian safety regulations. The car is also wider and offers increased space for the occupant. Maruti claims that the third generation DZire has 55 mm better rear legroom, as compared to the previous model. Moreover, the boot space has been increased to 378-litre. The engine options on offer at launch include a 1.2 L K12B motor producing 82 bhp and 113 N m of torque, while the diesel gets the 1.3 L DDiS motor with 74 bhp and 190 N m of torque. Both engines can be had with a 5-speed manual or 5-speed AMT (from V grade onwards), meaning there will be no drop in the fuel efficiency of the automatic variants, as compared to the manual variants. The petrol models deliver 22 km/L and the diesel models are rated at 28.40 km/L in the fuel economy department. The third generation DZire was launched for sale on 16 May 2017 in India. It will rival the recently launched Hyundai Xcent, Tata Tigor, Tata Zest, Honda Amaze, Toyota Etios, Mahindra Verito, Ford Aspire and VW Ameo. Sales of the Swift had reached cumulative worldwide sales of four million units in August 2014 (nine years and nine months since the start of sales in 2004). Especially in India, ever since its launch in 2005, the Swift steadily increased its sales in line with the market expansion due to economic growth, such as by adding diesel variants and sedans. Of the four million units, units sold in India account for approximately half of them. Also, approximately 19% were sold in Europe, and approximately 11% were sold in Japan. By June 2008, cumulative sales of the Swift reached 1 million and in January 2011, cumulative sales totaled at 2 million. 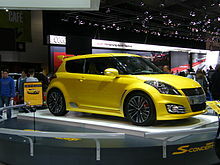 The Suzuki Swift has won more than 60 Awards including car of the year awards since its introduction as a global model. ^ "Suzuki Motor Corporation - Company Profile, Information, Business Description, History, Background Information on Suzuki Motor Corporation". www.referenceforbusiness.com. ^ "スズキ スイフト(SWIFT) カタログ グレード一覧" [Suzuki Swift grade catalogue]. Goo-net (in Japanese). Proto Corporation. Archived from the original on 26 February 2011. ^ "Specification: Chevrolet Cruze (HR51S) E and X" (in Japanese). Suzuki. Archived from the original on 5 December 2004. ^ "Specification: Chevrolet Cruze (HR81S) LS and LT" (in Japanese). Suzuki. Archived from the original on 5 December 2004. ^ "Spied! Next-Gen 2011 Suzuki Swift Shows Off Its Button Nose; Bound for U.S. – WOT". Wot.motortrend.com. Retrieved 26 February 2011. ^ "Suzuki Swift Sport Perhaps the best Japanese compact car ever". Sports Compact Car, Takezo Okiyama. ^ "Suzuki Swift to debut at the Paris Motor Show". Car Design News, 7 September 2004. ^ "Euro NCAP – Suzuki Swift". European New Car Assessment Programme. ^ a b c "Suzuki Begins Testing the Swift Plug-in Hybrid Micro-Car". hybridCars. 13 May 2010. Archived from the original on 16 May 2010. Retrieved 15 May 2010. ^ "Suzuki to Show Plug-in Hybrid Variant of Swift, Fuel Cell Variant of SX4 at Toyota Motor Show". Green Car Congress. 2 October 2009. Retrieved 15 May 2010. ^ a b "Report: Suzuki to introduce Swift-based PHEV in 2013". Green Car Congress. 11 June 2011. Retrieved 13 June 2011. 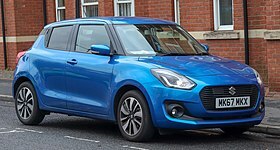 ^ a b "Suzuki Swift Plug-in Hybrid Gains Type Approval from Japanese Government; To Dealers in the Autumn for Testing". Green Car Congress. 14 May 2010. Retrieved 15 May 2010. ^ Amit Panday (26 March 2014). "Maruti to supply Swift hybrids to the government". Autocar Professional India. Retrieved 27 April 2014. ^ "All New Suzuki Swift". Motor Trivia. Retrieved 10 August 2013. ^ Hafriz Shah (12 July 2013). "Third-generation Suzuki Swift facelift officially shown". paultan.org. ^ Gaurav, Aseem (2 August 2013). "Top 10 exciting features of Maruti Suzuki Swift Dzire". India TV. New Delhi: Independent News Service. Retrieved 10 March 2014. ^ "Suzuki Swift S-Concept previews new Swift Sport". Caradvice.com.au. 2011. Retrieved 2 March 2012. ^ "2011 Suzuki Swift S-Concept". TheMotorReport.com.au. 19 May 2011. Retrieved 4 July 2011. ^ "2012 Suzuki Swift Sport". Suzuki.co.nz. 10 February 2013. Retrieved 10 February 2013. ^ "Euro NCAP results for Suzuki Swift" (PDF). euroncap.com. 2010. ^ Barari, Arman (ed.). "Suzuki Swift Sport SZ-R Priced at £14,249". Motorward. Retrieved 25 February 2013. ^ "Third-generation Suzuki Swift facelift officially shown". ^ "スズキ、スイフトに「デュアルジェット エンジン」と「エネチャージ」搭載車を設定". Archived from the original on 3 December 2013. ^ CarDekho Team. "Maruti Suzuki Swift Facelift Launched at Rs 4.42 Lac". CarDekho.com. Retrieved 28 October 2014. ^ "Pinder / Baker take BRC R2 Championship Lead". Archived from the original on 15 July 2015. Retrieved 15 July 2015. ^ a b "Suzuki Swift specifications". Suzuki.com.au. Retrieved 2018-10-13. ^ "Suzuki Launches Next-Gen Swift In Japan - CarDekho.com". CarDekho. ^ a b "Swift Sport - Suzuki Australia". www.suzuki.com.au. ^ "2017 Maruti Dzire launch date, specifications, images & complete details". Car Blog India. 18 May 2017. Retrieved 18 May 2017. ^ "Official Suzuki Swift 2017 safety rating". www.euroncap.com. Retrieved 2018-11-22. ^ "SUZUKI SWIFT". Aseancap. 2018-11-16. Retrieved 2018-11-22. ^ "Maruti Suzuki Swift Crash Test GNCAP". Global NCAP. Retrieved 2018-12-10. ^ a b "Worldwide sales of Suzuki Swift reach four million units". Suzuki. ^ "Aggregate worldwide production of Suzuki Swift exceeds one million units". Suzuki. ^ "GLOBAL SUZUKI". Retrieved 15 July 2015. ^ "Suzuki Swift: Awarded RJC 2006 Car of The Year". Archived from the original on 23 September 2015. Retrieved 15 July 2015. ^ "Suzuki Swift: Japanese RJC Car of the Year". Retrieved 15 July 2015. ^ "Swift bags Indian Car of the Year trophy, CBR250R wins IBOTY". Retrieved 15 July 2015. ^ "Audi RS5 wins Indian TopGear 'Car of the Year' 2011 award". timesofindia-economictimes. Retrieved 15 July 2015. ^ "Swift wins Gold Star award". Archived from the original on 8 November 2013. Retrieved 15 July 2015. ^ Stephen Turvil. "New Suzuki Swift Sport Honoured". Retrieved 15 July 2015. ^ "New Zealand Industry Award for Suzuki Swift". Retrieved 15 July 2015. ^ Geraldine Ashton Green. "Suzuki Swift voted 'Best Small Car'". Retrieved 15 July 2015. Wikimedia Commons has media related to Suzuki Swift. This page was last edited on 16 April 2019, at 07:45 (UTC).